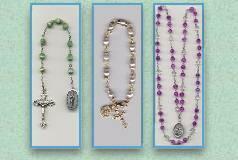 is the least expensive, and easiest rosary to make. It involves the least number of parts, beads, spacers, cord and Crucifix. 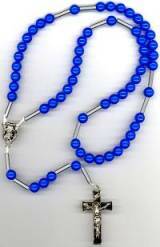 You may add a Center piece if you wish, to this style of rosary. basic barrel knots to complete this rosary. that a coating of clear nail enamel be applied to both ends of your cord. Allow a few minutes for enamel to dry. than when stringing the beads. Cut a length of cord 54 inches long. attach a Center piece to a Cord Rosary. Begin by cutting a length of cord 47 inches long. Tie a barrel knot approximately 8 inches in from the end of the cord. String 10 beads as usual. The spacer tubes are tiny cylinders of nylon. You may find some have become flattened during storage. by pressing firmly on the tube until they become round again. Tube spacers can be purchased in bulk HERE. After the first 10 beads, add a spacer, Pater bead, and another spacer. Tie a barrel knot about 1/2" from the last bead. to carry in purse or pocket. Tie a double barrel knot to form a "Knotted Center." Clip off excess of the shortest cord, leaving about 1/4" nub. Add a Pater, spacer, 3 Aves, a spacer, and a Pater to the long remaining cord. 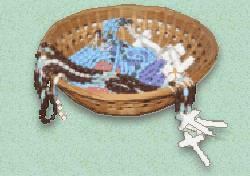 the previous Cord Rosary Instructions . Trim excess from remaining cord leaving about a 1/4" nub from the knot. Use a flame to melt the nub or coat with clear enamel. in the service of Our Lady! May Our Lord richly reward your dedication! Lewis & Co offers a lovely rosary kit which uses longer metal tubes for the separators.